Too lazy to carve a Halloween pumpkin this year? Let a squirrel do it for you! Just make sure they don't get their head stuck in it. Posted in Friday faves. 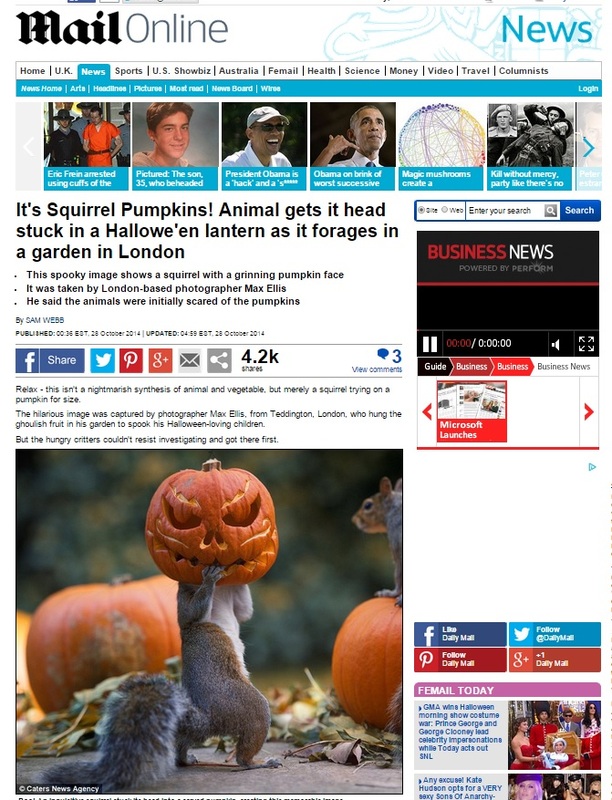 Tags: bats, pumpkins, Seriously Science?, social behavior, squirrels, zombies on October 31, 2014 by Mikel Delgado. Baseball Superstitions: Will they determine the World Series Champions? With only one or two games left in the World Series, there are many baseball fans out there right now who aren't changing their shirts, or who are wearing certain colors every day, or are maybe skipping that shave...in the hopes of bringing their favorite team to a win. I'm more than a little excited because my team is in the running. But can any of us really help our team win through our behaviors? Posted in other important things. Tags: baseball, BF Skinner, pigeons, San Francisco Giants, superstitions, World Series on October 27, 2014 by Mikel Delgado. Animals experience the "Uncanny Valley"
The uncanny valley is that strange feeling you experience when you see something that is almost, but not quite, human-like, such as animation in a film or video game, or robotic movements that mimic our own. You may even experience this feeling when you see other primates. Some folks have suggested that "the valley" may be what caused us to kill off Neanderthals (although I'm still looking for a more reputable source on this topic)! Long story short, turns out that a recent study suggests that monkeys are also disturbed by almost life-like images of other monkeys. Marc Bekoff gives some nice explanations for why animals might be hardwired to look for stimuli that match expectations of what other members of their species should look or act like (or as another scientist points out, these likenesses may not be visual at all, but could be sound or olfactory-based). Read it all here! What does this mean for robo-squirrel? Posted in Friday faves. Tags: animal play, cichlids, Cornell Lab of Ornithology, crows, monkeys, play behavior, ravens, robosquirrel, stereotypies, Uncanny valley on October 24, 2014 by Mikel Delgado. Why is there an alpaca in my grocery store? What is the deal with emotional support animals? For the record, they are not the same thing as a service animal - but there's a lot of confusion about what is allowed and what isn't - and it's easy to fake a letter. Patricia Marx goes undercover and explores what happens when you bring a "therapy turtle" to a museum. Read here! Posted in Friday faves. Tags: aggression, cichlids, crocodiles, emotional support animals, human-animal bond, mirrors, predation, social behavior, therapy animals on October 17, 2014 by Mikel Delgado. Are you obsessed with your fitness tracker? What does the research say about how well they work? Read all about it here, in a post I wrote for the Berkeley Science Review. Posted in other important things. Tags: exercise, Fitbit, fitness trackers, motivation, obesity on October 13, 2014 by Mikel Delgado. NY Times featured a nice summary of what little we know about this beautiful and socially complex animal. Read about the giraffe here. Posted in Friday faves. Tags: accelerometers, cats, giraffes, mountain lions, pumas, stress on October 10, 2014 by Mikel Delgado. Cats and urination outside of the litterbox. 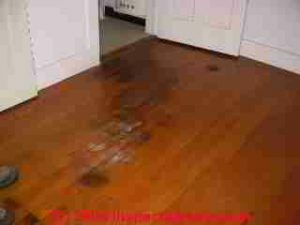 Cat urination outside the litterbox can damage relationships and floors. Photo via InspectAPedia. Urination outside the litterbox is one of the most common behavioral reasons cats are abandoned and euthanized. Litterbox avoidance is a frustrating problem to live with, and damages property and the bond between an owner and their cat. While owners often attribute this behavior to a complex “revenge” plot by the cat (“he’s mad at me for x, y or z”), urination outside the box is typically caused by one of three things: something about the box the cat doesn’t like, a medical problem, or stress. Posted in cats. Tags: behavior problems, cat behavior, Feline Idiopathic Cystitis, human-animal bond, litterbox problems, litterboxes, urinary tract infections on October 7, 2014 by Mikel Delgado. "Babbling" is the first stage of language development in humans in which infants make sounds that are considered pre-linguistic and practice for future chatting. Babbling has been found in several other animal species (including bats, monkeys and parrots), and now maybe in fish? Turns out that baby snapper (larvae) make "knocking" sounds that adults also use, which function to keep fish together in their schools. Read more here. Posted in Friday faves. Tags: aggression, babbling, communication, dogs, DogSpies, language development, picture processing, snapper, steamer ducks on October 3, 2014 by Mikel Delgado.